You guys, I adulted today! Despite working mandatory overtime again, and being bummed that the fella is leaving for two weeks in Istanbul tomorrow, I managed to do some adulting today and cook for myself for the first time in over a month! I made myself a lovely cranberry goat cheese salad and Mongolian beef while listening to Nick Offerman's new book "Paddle Your Own Canoe: One Man's Fundamentals for Delicious Living". I even did my dishes before sitting down to eat! 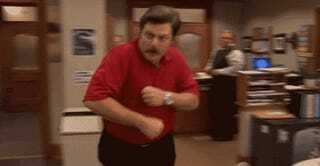 I believe this makes Ron Swanson my spirit animal. What were your triumphs today?